And we’re back! Today we’re checking out a great selection of bronze from Chinese-based Silken Cymbals (distributed in the U.S. by Eastwest Cymbals). Let’s get to it. Boutique cymbals are most often associated with Turkish tradition, but there are a number of modern smiths creating professional quality bronze in China using techniques that date back hundreds of years. Most of these Chinese cymbal makers have expanded their methods of manufacture to offer instruments that work in the rock, pop and country realms, but they’ve done so without sacrificing some of the complex, breathy character that defined the Eastern sound for so many centuries. The result is a fascinating balance of ultra-modern and traditional tones. One of those Chinese cymbal producers is Wuhan-based Silken Cymbals. 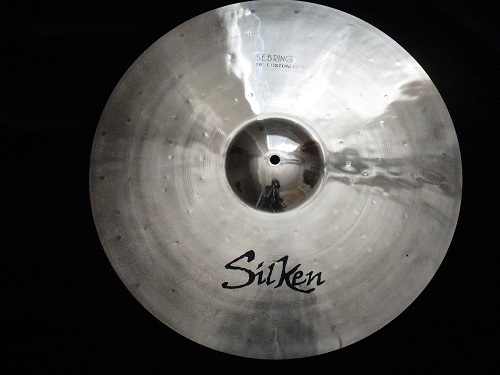 Founded by master cymbalsmith, Ken Cheng, Silken specializes in B20 cymbals designed for modern applications. The cymbals are forged, lathed and hammered using centuries-old techniques, but have a very contemporary feel, comparable to offerings from major manufacturers. For our first Silken review, we received a selection of pies from the company’s Sebring series. All of the Sebring models are medium-thin to heavy in weight, and have a brilliant finish, offering a bright, clean sound intended for rock and pop performance. Let’s take a look at each cymbal individually. The 20” Sebring Custom Ride is a heavy cymbal with a medium profile and a large, semi-integrated bell. It’s fairly stiff, even for its weight, but still has a surprisingly broad spread underneath a very separated stick sound. I was a little disinterested in the Custom Ride at first because I’m just not normally a fan of heavy rides. However, after test driving it through a few rehearsals, I really warmed up to its fairly unique sound and feel. At every volume, each stroke produced a sharp, clear ping that remained present (but rarely overwhelming) in every context. Even the loudest guitar/bass/keys combo couldn’t wash out the Sebring’s projection. But, limiting the Custom Ride’s appeal to ping alone would be a disservice. The ride had a surprisingly complex wash underneath that added some real dimension to low-volume play. It was dark, a little smoky, a little trashy, and a tiny, tiny bit weird. I really appreciated that kind of breath, as it seems very rare in cymbals of that weight. I have a similar ride from one of the big three manufacturers (a leftover from my shred metal days), and when I compared the two, I was very surprised by how much more dynamic the Silken model was. Crashing the Custom Ride yielded a somewhat gong-y response with a long, long, long sustain – like, hit it, go take a wiz, come back to the drum set, and still hear the tail end of it boiling down, long. In a musical context, that ring was washed out by even medium-loud play, but it could be a little tricky in a recording situation. Finally, the bell was another animal all its own. While it was a natural step up in pitch from the bow of the ride, the bell itself had a surprisingly deep tone that separated it a bit from the cymbal as a whole. That may sound a little bizarre, but it was actually very cool. It helped the bell keep from eating up all of the high-frequency sound (re: guitars) around it – kind of grounded it a bit. It still had plenty of cut, but just didn’t demand as much ear space as the bells on similar cymbals. It felt a little more musical. The Custom Ride might be a little too aggressive for some scenarios, but I think it would find a very happy home in most rock, gospel and pop contexts. I also think it would be a tremendous asset to any metal drummer’s kit, as it can handle super high-volumes while still offering some interesting musicality. The 17” Crash, unlike the Custom Ride, was much closer to a medium or even medium-thin weight. It had much more edge wobble than I’d expected after playing the ride, and it produced a really interesting dark wash. Hard hits offered an explosive response with plenty of cut, but the decay had a much more pronounced version of the complex spread heard in its sibling ride. I felt like the 17” Crash also played a little bit bigger than its size. It had a lush, beautiful response at medium volumes that felt more akin to an 18 or 19” cymbal than a conventional 17”. I really loved this cymbal, and considered it my favorite of the bunch. Then I looked at the price – less than $90, are you kidding me? This cymbal is an absolute steal. Versatile, musical and very dynamic, the 17” Sebring Crash proved to be a real stunner. I’m not much of a splash guy, so I feel a little out of sorts writing this part of the review. That said, I found the 8” Sebring Splash to be a uniquely interesting little instrument. It had a much softer attack than I expected, but projected enough to sit comfortably in a loud mix. Medium and hard hits thankfully didn’t result in the tinny, shrill explosion of some other splashes. Instead, the Sebring model had a quick, trashy wash that sat nicely among other cymbals. The initial decay was extremely fast, but there’s a secondary note that lingers for a few extra seconds after the first settles down. There were a couple of weird overtones that popped up after heavy strokes, and it seemed to activate some resonant frequency in the 17” crash if they were too close together, but that was all pretty well eliminated in a band setting. Again, those accessory tones might be a little distracting under a close microphone, but in a live context, I don’t think they’d be an issue at all. At only $33.00, the 8” Sebring Splash would make an excellent gigging splash, and I think it would fit very well in a gospel or hip hop setting. I was tremendously surprised by the Silken Sebring models we received for this review. While I was expecting something much more conventional, each cymbal provided a surprising musicality. They really changed my mind about what these kinds of cymbals are capable of doing in a live setting. For the price, I’d say the cymbals in the Sebring series are a fantastic bargain. Rock and pop drummers take note: if you’re looking for a dynamic sound that still suits your needs, these cymbals are absolutely worth checking out. is this company still in business? where can i buy them?